The Incunabulum and the Plastic Bag is an essay thinking through the oddness and importance of the bookshop in art galleries, commissioned for A Manual for the 21st Century Gallery, Just What Is It That Makes Today’s Institutions So Different, So Appealing?. Twelve authors – artists, curators, academics and directors of international galleries and museums – trace a trajectory around each typology of space, using them as springboards for wider investigation. 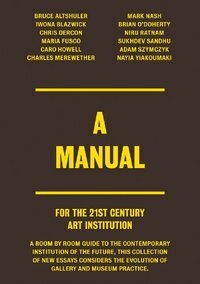 Contributors include: Bruce Altshuler, Iwona Blazwick, Chris Dercon, Maria Fusco, Caro Howell, Charles Merewether, Mark Nash, Brian O'Doherty, Niru Ratnam, Sukhdev Sandhu, Adam Szymcyzk and Nayia Yiakoumaki.